Pop festivals are an enduring success story of Britain’s popular music scene, and each year there are over 800 festivals up and down the land. These often take place in beautiful parts of the countryside—the promise of the pastoral being part of the attraction, of course. 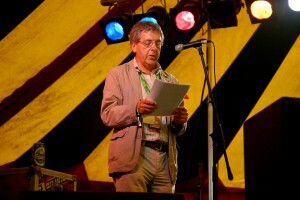 This summer, in July 2011, I was appointed Professor in Residence at a pop festival in the English Lake District. It was great fun. The weather was terrific, and the sold-out crowd was chilled. I bumped into an ex-student backstage (back field, actually), whose band were playing that night in the coolest venue, the Jazz Tent. I did actually hear him say, ‘Excuse me, are you George McKay?’ and a few other heads turned, in case they were missing someone famous. I’ve been going to festivals for over 35 years. My first was Reading Festival in 1977, at which the Sensational Alex Harvey Band and Thin Lizzy headlined. And I’ve given lectures in unusual places too—including a couple of years ago at a techno free party opposite a police station in Bristol. (In fairness, it was sponsored by the ESRC.) My academic interest in festivals is evident from my first book in 1996, Senseless Acts of Beauty, which explored the free festival movement, to a cultural history of Glastonbury Festival in 2000, and more recently AHRC-funded work on 1950s jazz festivals. I’m currently working on a new collection about festival culture, probably to be called Carnivalising Pop. But to do the academic work of lecturing actually at a festival was something new altogether. Not just for me—I don’t think there has ever been a proper Professor in Residence at a pop festival before. I hoped this would be ground-breaking knowledge exchange! I thought it would be a terrific opportunity to take material out to a different audience and in a completely different kind of setting. After my public lecture in Bristol for the new travellers and free party people, I came away really buzzing, and just wondering, Why do lectures have to be in lecture theatres? And where else can I do public engagement? 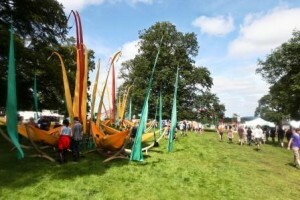 Kendal Calling is a quirky, ‘boutique’ pop festival held each summer in an ancient deer park, with huge oak trees all around and distant mountains on the horizon. It won the Best Small Festival category in Festival Awards UK 2010, and the same category at the 2011 Live UK Industry Awards. 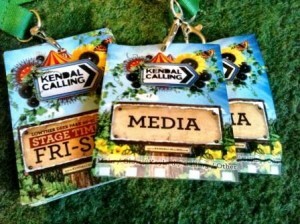 I met festival co-director Ben Robinson at a festival research project at Leeds University a couple of years ago, and we started talking about how I could get involved at Kendal Calling. Ben was keen for the festival’s activities to widen out from primarily live music, to have a few more unusual and intriguing other kinds of creative offerings. So I came up with this idea of a Professor in Residence for a pop festival, and thankfully he jumped at it. There was a lot of media interest in my role, which was good for the university and for the festival alike. I remember doing before and after radio interviews on a BBC station, the second of which involved me after the event, on the Monday morning, a little bleary-eyed and halfway through packing up my tent, wandering around the festival site describing down the mobile phone to listeners the post-apocalyptic landscape of green fields after three days of festival. And giving those listeners the good news as well: there was already, at 8 am, a snaking line of litter-pickers sweeping slowly across the main site clearing up perfectly and minutely. I found out when I first got on site that the Soapbox tent I was due to lecture in was where the comedy acts were on—but I didn’t take it personally! My lectures were on two current research projects—pop music and disability (from Shakin’ All Over, my next book), and gardens and politics (from my then just-published book, Radical Gardening. Reviewed in the Times Higher Education as ‘a truly important book’, by the way). It’s fair to say that the attendance at the first, on the early Friday afternoon, when people were still arriving and pitching their tents, was, well, let’s say, quality over quantity. A very select group of specialists. But like a true professional I stood on stage in that tent and did my 20 minutes of talking—I’d prepared images on a powerpoint presentation, to add a little visual stimulation, but the technical equipment wasn’t actually there, and the light made by the sun on the striped tent roof would have made a projector difficult to see anyway. I was caught up in the liberatory spirit of the festival, and just improvised where necessary. For my second lecture on Sunday afternoon, the festival’s cycle of energy (that’s the kind of language one uses after a weekend at a pop festival) had slowed down, people were in less of a rush to do things, and I now had a considerable audience. They were sitting and lying on the rush matting cover on the soapbox tent floor waiting to hear something interesting and stimulating for 20 minutes. Young, old, toddlers and even some babies. I started to talk from my lecture notes and found myself competing with a band playing on the main stage, whose loud music was coming straight from their speakers, past their crowd and up the hill, and into my space. It was a song by a post-punk band from the 1970s called the Stranglers, ‘Nice and sleazy’, which was in fairness an acceptable accompaniment to my own words about punk rock and the disabled body. I had a long queue of interested people asking me questions and making comments at the end. A pop festival is a temporary space of pleasure, where young and not-so-young people get together, a usually green space, with loud, eclectic and competing soundtracks. Many of those youngsters either are students, or going to university in a year or two. Offering some intellectual content—not too much, but not diluting it either—at this special locus worked, in my experience, surprisingly well. Roll on next summer! After all, my personal assistants (two teenaged daughters—each with their own production pass courtesy of dad) demand further festival appearances.